Also called 'Californian Lilacs', they have been skilfully grown to form a tall standard tree for instant impact. In spring, they produce clouds of lovely sky blue flowers in clusters for several weeks. Hardy to about -8C so OK in all but the severest of winters it will continue to perform in your garden for many years. Great as a pair in large pots framing doorways and gates. Now you can get that classic look of lovely evergreen trimmed topiary standard lollipop form trees, and combine it with a burst of flower power in spring too. 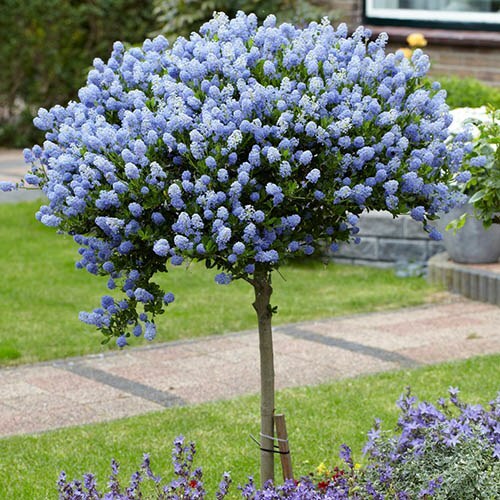 This stunning pair of Ceanothus Repens, also called 'Californian Lilacs', have been skilfully grown to form a tall standard tree for instant impact. In spring, they produce clouds of lovely sky blue flowers in clusters for several weeks. After flowering, their deep green evergreen foliage will provide year round interest too, and is easily clipped to shape once a year. Hardy to about -8C so OK in all but the severest of winters it will continue to perform in your garden for many years. Great as a pair in large pots framing doorways and gates. Most unusual. Supplied a as pair of standard lollipop form trees 90-100cm tall in 3L pots, with a well trimmed head with buds about to flower.